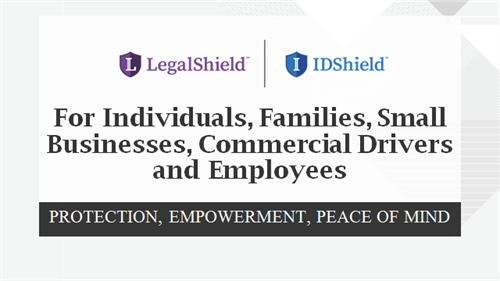 I am a full service LegalShield Independent Associate and offer a portfolio of Legal & ID Theft Plans that protect the legal rights and identities of our members. I specialize in the Small Business and Employee Benefit division of our company where we help small businesses affordably protect and grow their business. By means of offering a voluntary employee benefit to their staff at no out of pocket expense to the company, this helps reduce absenteeism, stress, health costs and enables the business to run more smoothly and efficiently. LegalShield was established 1972 and currently serves 1.75 million memberships, protecting and empowering 4.375 million lives, and approximately 140,000 businesses. I have been an Independent LegalShield Associate, Small Business, CDLP & Group Benefits Specialist since 2006. Please contact me for more information on how we can assist you or your business and find which plan best suits your needs.